The perfectly flat scrubber head gets water and dirt out of the deepest cracks and rough surfaces. The fibres are not flagged to withstand heavier debris and surfaces. Built-in scraper to remove tough dirt. Quickie BULLDOZER 24 inch rough surface pushbroom is made with rugged, specialized material designed for DIY projects where heavy debris is present. This rough surface pushbroom uses extra stiff poly fibbers to easily sweep gravel, sticks, wet leaves and caked on dirt from outdoor surfaces such as driveways, sidewalks and parking lots. The broom head is set in a heavy duty resin block with diamond plate design that won't warp, rot or crack under normal usage. 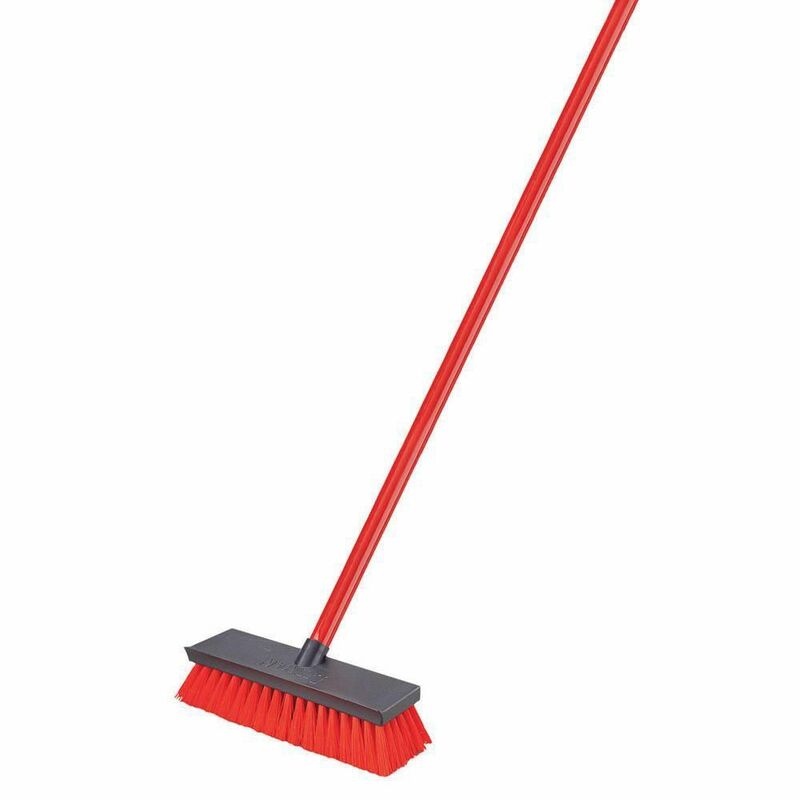 This broom comes complete with clips attached to the block which can be used to store the broom unassembled. You can also easily remove the clips with pliers if desired. Floor Scrub The perfectly flat scrubber head gets water and dirt out of the deepest cracks and rough surfaces. The fibres are not flagged to withstand heavier debris and surfaces. Built-in scraper to remove tough dirt. Floor Scrub is rated 4.8 out of 5 by 6. Rated 5 out of 5 by dwhessong from Works great. Bought this to clean dog kennel. Works great. Cleans all the dried stuck on stuff. Rated 5 out of 5 by Homemaker from Just What I Needed I needed a good garage scrub brush and this is just what I needed. Rated 5 out of 5 by Madamanc from Good Floor Scrubber Good value for the money. Used it scrub the garage floor for painting. Rated 4 out of 5 by Kenk from very good Used for cleaning my concrete deck. Durable and did the job but for me the handle could be set at an angle closer to the ground which would enable you to put on a bit more force and get the advantage of the bristles in full contact with the work surface. Rated 5 out of 5 by daveg from good product used for cleaning ceramic tile in kitchen, and used to clean deck. Rated 5 out of 5 by LpKez from Works great I bought this to use on my kitchen tiles and it works great. Works well to get the grout clean when you turn it sideways also. It is good for when you really need to clean your floors instead of just pushing dirty water around with a mop.